What makes the Samsung Galaxy Watch so good, apart from its performance, is the fact that it actually looks like a watch! The Galaxy watch gives a feeling of authenticity thanks to a round face, watch hand shadowing and even the sound of ticking. If you like the look of a real watch, with added smart technology, this is for you. What makes the Samsung Galaxy Watch such a standout device is the ability for you to customise it to suit your lifestyle. 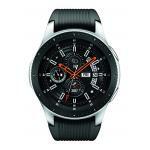 Bluetooth or standalone LTE models are available, as well as a variety of body sizes and watch faces. As for straps, go with the silicone selection, which comes with the watch, or use one of your own. The Galaxy Watch is compatible with 20mm and 22mm straps, depending on the size you choose. Why press a button or turn the bezel on when you don't need to? Simply set the S-AMOLED display so you can see the time at all hours. The Samsung Galaxy watch more than holds its own against similar fitness tracking devices, with extra sensors and a revamped Samsung Health app. It auto-detects six of 39 exercises, and pushes you along when you need to up the pace. Sleep, an important part of any health regime, is monitored by an improved tracker. The Galaxy watch gives you the potential to take calls and messages on the go, and tune into your favourite sounds on the run.